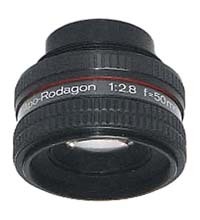 The APO-Rodagon 50mm f2.8 is Rodenstock's highest quality lens for 35mm negatives. It is particularly recommended for critical enlarging applications such as exhibition quality prints. The APO-Rodagon delivers an outstanding level of sharpness, contrast, and correction for chromatic aberration. These lenses have the "mid" style barrel design with rubberized aperture ring, illuminated aperture scale, click stops for each half stop, and disengageable click stop feature.